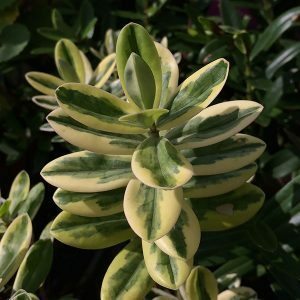 We do like Hebes, and Hebe franciscana ‘Waireka’ is one variety that can be grown both for the variegated foliage as well as the flowers. This is a small evergreen shrub, and it gives the gardener attractive purple flowers from mid summer to autumn as well as good foliage year round. It does differ greatly from other Hebe varieties. The foliage is green with strong cream margins. The plant itself will reach nearly 1 metre in height with a spread of around .8 metre. Easily pruned to a smaller size, this is a great addition to the garden border and is equally at hone in a pot or container. Best grown in full sun with perhaps some afternoon shade. A humus rich well drained soil is best. In a container any good quality potting soil will be adequate. A little general purpose fertiliser in spring will keep the plant looking great. Mulch around the plant to help maintain a cool moist root run. Always allow the soil to partially dry between watering. Tip prune after flowering to create a dense compact growth habit.